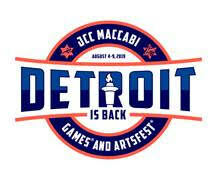 Jake Provizer of Farmington Hills remembers being “anti” Hebrew school. After his bar mitzvah at Temple Israel, the incoming Michigan State University freshman begrudgingly attended Monday night school. It was not until he found himself encircled by his newest friends during Havdalah at his first NFTY convention in Chicago that he felt his Jewish identity taking hold. Temple Beth El youth are out with their Teen Network Weaver Joseph Unger, right. 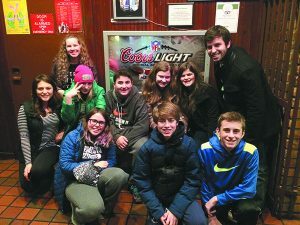 There are about 4,400 Jewish teenagers in Metro Detroit, but only about 1,000 — or 25 percent — think like Provizer and are active in Jewish living. The rest of this age group, though they value things like Jewish holidays and being with Jewish friends, are pulled in different directions in a post-religious society that values secular pursuits as they look to build their college application portfolio. As teen free time dwindles, Jewish youth programming needs to be more meaningful to fulfill the teens’ social action desires as well as their need to socialize in a realm outside of social media. The above findings are from a 2014 study conducted by the Jewish Federation of Metropolitan Detroit’s Task Force on Jewish Engagement. 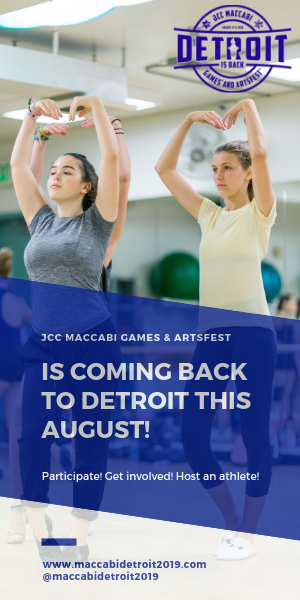 Recognizing that a robust Jewish community can only continue by nurturing the next generation, Detroit is leading the nation in financial commitment to Jewish teen engagement with its Teen Network Weavers (TNW) initiative. The TNW term was coined by Rabbis Jen Lader and Josh Bennett of Temple Israel. “It is crucial that we re-invest in our teens to connect them to their rich heritage that can offer so much guidance as they navigate their way through the many modern challenges they face,” said Jeffrey Lasday of Federation’s Education Department. TNW funding is provided by a $150,000 grant from the Hermlin-Davidson Center for Congregational Excellence. The grant is then split and matched three ways between Temple Israel of West Bloomfield, Temple Beth El of Bloomfield Township and a consortium of local Conservative synagogues. The match calls for congregations and Federation to split the cost of each weaver, an administrator and some programming costs. Each weaver is hired on a two-year rolling grant basis. The pioneering initiative is unique compared to how other Jewish communities in major metropolitan areas attempt to keep teens involved Jewishly, according to Lasday. The three weavers function at the highest community level instead of the individual congregation level as they are guided by a Teen Network Weaver administrator on Federation’s staff. 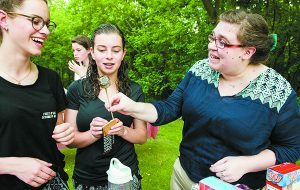 The initiative strives to keep Jewish teens in the fold by meeting them where they are — both literally and spiritually. The weavers’ jobs demand a much more proactive expertise than their part-time counterparts of previous generations. TNWs have backgrounds in social work and teen crisis management as well as a depth of knowledge of Judaism. Heading up the TNW team is Barrett Harr, Federation’s coordinator of Jewish teen engagement. Harr moved here from Texas after 15 years of congregational Jewish youth fieldwork and this spring completed the Executive M.A. Program in Jewish Education at Hebrew Union College-Jewish Institute of Religion. Shortly after she graduated college, Jacki Honing, 26, found herself at a dinner meeting with a potential employer on a Friday night. “As a 20-something, I realized I had some choices to make: Do I opt for the corporate life, or do I want to work in the Jewish world?” said the Las Vegas native who moved to Detroit for the weaver job in January and works with teens in the Conservative movement. She dropped her corporate ambitions and committed her professional pursuits to the Jewish community. 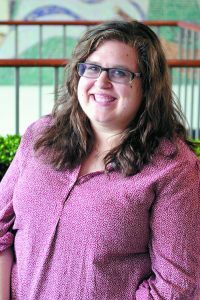 Honig channels her memories attending Jewish preschool, day school and socializing in United Synagogue Youth and Camp Ramah as she mentors teens making personal choices of how to live more Jewishly. Well-versed in the teen mindset, she takes a “one-size-does-not-fit-all” strategy for finding just the right opportunity to spark a teen’s interest in Judaism. Allison Bloom-berg, 17, of Farming-ton Hills, who will be a senior this year at Frankel Jewish Academy in West Bloomfield, said Honig has been “a huge help” in supporting MCUSY (Motor City USY) during a transitional phase and helped keep the Conservative-based chapter growing in the right direction. 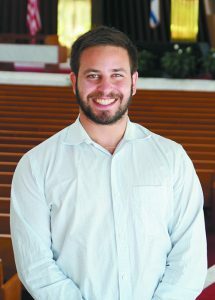 Joseph Unger, the only native Detroiter of the weavers, works as the youth adviser at Temple Beth El in Bloomfield Township. Much of the NFTY programming at TBE focuses on social justice and volunteering, such as monthly trips to soup kitchens or other work coordinated by Repair the World Detroit. Programs like this over the last year have attracted a core group of 10 kids, plus 35-40 others who have attended at least one program over the year. Other successful programs last year included Havdalah at the William Livingstone Memorial Lighthouse in Detroit with TBE’s Rabbi Mark Miller. At 25, Unger likes to be honest with the teens, telling them he wishes he had taken his own religious schooling more seriously. He did get involved with Michigan State University Hillel and traveled with the group on a life-changing Birthright Israel trip. “That trip really made me think more about Judaism and how I wanted to give back to my community,” he said. If Ethan Bennett, TNW for Temple Israel, had his way, he would make sure each teen understands the connection to the Jewish homeland — not during Friday evening services, but by taking them on a hike into the Negev Desert and then studying a text that sources the very trail where they had just walked. Bennett tries to do the next best thing by facilitating informal Thursday night programs at Temple Israel where teens can learn and discuss topics pertaining to Israel. 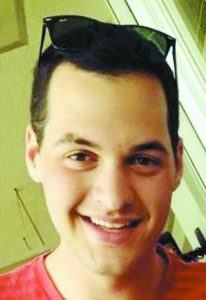 A native of St. Louis, Mo., Bennett was active in NFTY and spent a gap year in Israel, where he bolstered his skills in working with Jewish teens. He also finished his studies at Hebrew University in Jerusalem, where he studied Hebrew and Arabic and worked on youth partnership programs between Arab and Jewish teens in Israel. Bennett finds his job as a weaver very fulfilling and says he is very grateful for the wide support he and his cohorts are receiving. He began his position in October 2015 after working with Jewish teens throughout the country. However, he said he has never seen the devotion and commitment of a community for teen outreach as he has witnessed in Detroit.